Find valuable tips and tricks on how to optimize your titration workflows in the new METTLER TOLEDO Automation Guide. Download the Titration Automation Guide today and learn how titration processes can be automated for highest efficiency and security in the laboratory. Consult the new Titration Automation Guide and get a detailed overview and advice on how processes can be enhanced by automating titration workflows. Modern laboratories look into automation to address the demands for high throughput and variety of samples and workflows. Automation is not only concerned with aspects of efficiency. It also supports the user in terms of quality and data security by improving reproducibility, avoiding transcription errors and improving operator safety. Automation also ensures operational safety when using volatile and strong smelling solvents and reagents, avoiding direct exposure to the atmosphere and evaporation. InMotion Autosamplers – Designed to be modular and tailored to your needs, the autosampler maximizes throughput with minimal space and increases productivity without sacrificing laboratory bench space. The autosampler can be put together according to your sample needs - add modular boards for extra pumps, a CoverUp™ system for operational safety and thermostating water bath sample trays. SmartSample™ – Enter the sample information directly on to the SmartTag beaker while weighing with the Excellence Balance. The InMotion™ Autosampler automatically recovers all sample information from the SmartTag, eliminating inefficient workflows and transcription errors. SmartCodes™ – Simply label the samples with a barcode and LabX Titration PC software will find the corresponding titration method for every sample. Methods encoded in the Smartcode can be automatically selected by the titrator when read with the barcode reader or the InMotion's RFID reader. Liquid Handler – Extract a sample volume with high accuracy and repeatability. The Liquid Handler extracts sample volumes from beakers on the Sample Handler, the Rondolino autosampler or the InMotion autosampler. The volume can then be dosed into a beaker on the Excellence titrator and, if required, diluted with a defined volume of up to three different auxiliary reagents. 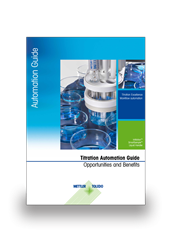 To learn more about METTLER TOLEDO's Automation solutions, please download the New Titration Automation Guide. METTLER TOLEDO is a leading global manufacturer of precision instruments. The company is the world’s largest manufacturer and marketer of weighing instruments for use in laboratory, industrial and food retailing applications. The company also holds top-three market positions for several related analytical instruments and is a leading provider of automated chemistry systems used in drug and chemical compound discovery and development. In addition, the company is the world’s largest manufacturer and marketer of metal detection systems used in production and packaging. Additional information about METTLER TOLEDO can be found at http://www.mt.com.